This MFT Minimalist Stock Is The Lightest Stock On The Market! With Heavy Input From Operators We Utilized The Minimal Amount Of Material While Maintaining All The Necessary Functionality. Battlelink Stocks Are The Evolution Of Battlefield Technology. Manufactured Using A Specially Developed Reinforced, Super Tough Polyamide From Dupont's Military Plastic Division. Putting The Stock To Your Shoulder Is The Foundation Of Any Stock. Holding True To The Basics While Adding Functionality With The Minimal Amount Of Material Possible Was Our Goal. We Saw The Need To Make A Stock That Offers All Of The Functional Requirements While Keeping The Weight Under 6 Ounces. This Stock Adapts And Changes To Your Environment Or Operational Needs By Utilizing Custom Accessory Mounts And Is Able To Accept A New Optimized Sling Configuration. This Ultimately Makes Our Stock The Lightest In Today's Accessories Market. This Stock Will Lighten And Enhance Any Rifle And Even Shotgun That Uses A Mil-Spec Tube Adapter. Truly Military Grade, It's Designed To Take Extreme Recoil And Abuse. This Stock Will Fit Just About Any Application For Any Modular Designed Gun. This Combo Also Comes With A USA Engraved Buffer Tube. 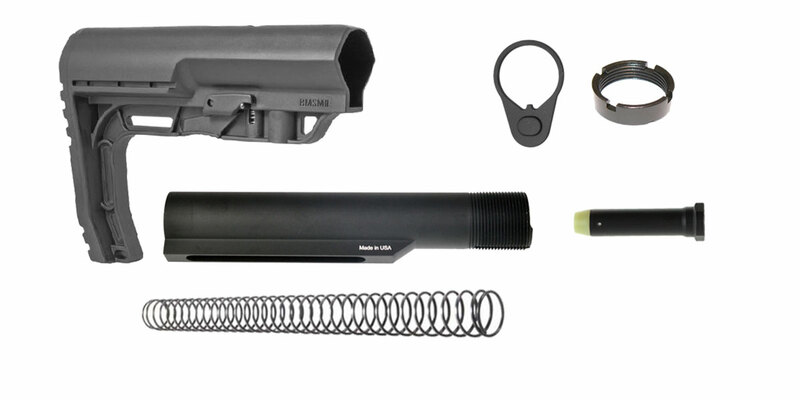 This Combo Also Includes A Standard Buffer Recoil Spring, End Plate And Castle Nut. Also Includes A KAK Industries 3oz Buffer As Well.